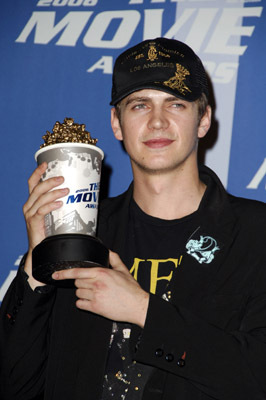 Hayden Christensen was named best villain for his performance as Anakin Skywalker in Star Wars: Episode III - Revenge of the Sith at the 2006 MTV Movie Awards. The 36-year-old actor received the award for his noteworthy performance as the young Darth Vader who betrayed the Jedi order, murdered his wife and attempted to kill his master Obi Wan Kenobi. The young actor was up against some stellar competition at the award ceremony Other nominees in the MTV villain category included Ralph Finnes as Lord Voldermort in Harry Potter and the Goblet of Fire and Cillian Murphy as the Scarecrow in Batman Begins. Hayden said: "This is very cool because you guys voted for it. I want to thank you. I want to thank George Lucas for giving me the chance to play such a cool character. "I want to thank George Lucas for giving me the chance to play such a cool character." In April 2017 the Hollywood star made only his second appearance at Star Wars: Celebration Orlando to salute of the 40th anniversary of Star Wars: Episode IV - A New Hope. Do you think Hayden Christensen deserved the award? And does he deserve the high level of criticism that many Star Wars fans give him for his performance as Anakin Skywalker in the Prequel Trilogy? Let us know your thoughts in the comments below.